Cobot (Collaborative robots) is a robot that can cooperate safely and steady with human. The up to date sensor has improved the robot movement and stop the operation by itself when touch or detected the force from human. Cobot is the innovation that draws attention from many industrial sectors extremely. It’s famous because it can cooperate with human to do a job together without fence which is different from former generation robotics and synchronize with human safely in working, also do some insecure job instead of human. 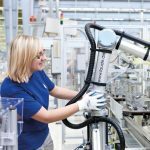 In present, many corporations are starting to produce Cobot for industrial use, for example, Sawyer by Rethink Robotics, KUKA LBR iiwa, Universal Robot, ABB Yumi and FANUC Robot CR-35iA.